Soap nuts liquid ultra-concentrated laundry detergent and cleaner - Extreme 18X - is simply the MOST concentrated and effective natural laundry detergent and household cleaner you will ever find. Only 8-ounces replaces 17-pounds of conventional laundry products. Why ship water and fillers? This liquid concentrate contains NO sulfates, parabens, phthlates, phosphates, petro-chemicals, dyes or chemical brighteners. It is fully sustainable from a renewable resource, non-toxic and biodegradable. Soap Nut Liquid Extract is derived from Sapindus Mukorossi Organic Soap Nuts - the world's finest. EXTREME 18X is a NaturOli proprietary formula produced and bottled entirely in the USA.Extreme 18X has a long 2+ year shelf life. Extreme 18X is ideal for High Efficiency (HE) washers and all front loading and standard washing machines. It reduces or eliminates residue, mildew and odors and eliminates the need and expense for softeners and dryer sheets. It is also safe for delicate fabrics and 100% fragrance free - perfect for sensitive skin and noses! For laundry, use only 1/2 teaspoon of Extreme 18X concentrate per HE load of laundry, (1/2 of a cap-full) or up to 1 teaspoon (1 cap-full) for standard washing machines. If you desire a scent, we suggest putting a few drops of your favorite essential oil on a clean rag and just toss it in your dryer along with your clothes. For house-hold cleaning, dilute as desired for a plethora of cleaning uses. See 'Using Soap Nuts', above, for a few ideas to start with. A pocket-sized 8-page pamphlet with details on how to use soap nuts is included with every order. Tip for first time users: Start fresh! 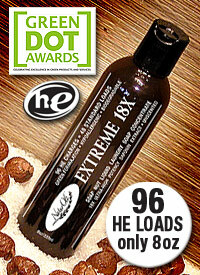 Run an empty load or two (or with some old rags) using about a teaspoon of EXTREME 18X. This is to purge your machine of built-up residues left by your old detergents. This will help you avoid having that old detergent from being released back into your good laundry. Your machine will also begin smelling like new again!